MUSA, the japanese kendo fighting companion, was unveiled by the Manufacturing & Mechatronics Lab of Seoul National University this week. 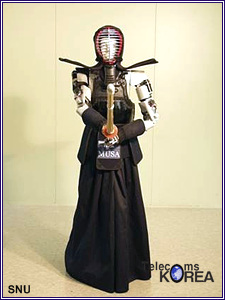 MUSA is 163cm tall and weighs 70kg; it is designed to make use of Kendo moves to help human fighters. It has sensors to measure the amount of power put on its bamboo sword and defend attacks. The MUSA kendo robot is able to fight at different levels of skill, depending on the opponent. Ultimately, the development team hopes that the kendo robot will reach the third Dan level of excellence in fighting. He [Swordmaster Gurney Halleck] gestured to the practice dummy. "Now, we'll work on your timing. Let me see you catch that thing sinister. I'll control it from over here where I can have a full view of the action. And I warn you I'll be trying new counters today." The fencing robot/mirror system also had higher and higher skill levels available; it could defeat even the most skilled human practitioners (unless they were prescient, of course). The MUSA kendo robot is a logical extension of the traditional "mechanical" aids used for centuries in martial arts, like the (usually wooden) mook jong, muk yang jong or spinning Wing Chun dummies. When the novice strikes one of the projecting arms, the dummy spins, appearing to strike back with other projecting arms.